The morphogenetic approach as powered by analytical dualism offers an appealing account of the processes whereby people - through their reflexivities - reflect back on structures and cultures during the double and triple morphogenesis of agency. However, in order to further specify an account of social change, this paper argues that it would be helpful to provide an account of what occurs in the other direction as well: from the direction of structures and cultures, between each other and towards people, also at the points of double and triple morphogenesis of agency. 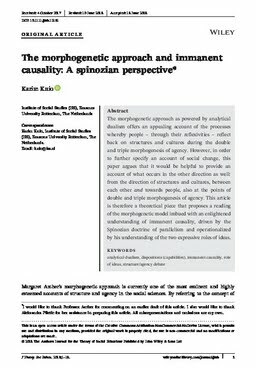 This article is therefore a theoretical piece that proposes a reading of the morphogenetic model imbued with an enlightened understanding of immanent causality, driven by the Spinozian doctrine of parallelism and operationalized by his understanding of the two expressive roles of ideas.